Due to this hidden nature of ADS, hackers have been exploiting this method to secretly store their Rootkit components on the compromised system without being detected. For example, the infamous Rootkit named 'Mailbot.AZ' aka 'Backdoor.Rustock.A' used to hide its driver file into system32 folder (C:\Windows\system32) as a stream '18467'. Here is the screenshot showing the above steps in execution. 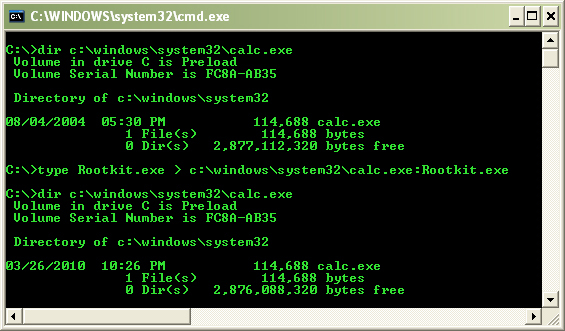 Note that there is no change in the size of calc.exe even after adding the stream file to it. These characteristics makes the streams a hidden threat. Here is the short demo program which enumerates all the streams within the given file or folder. Above program initially opens the input file using the FILE_FLAG_BACKUP_SEMANTICS for reading streams. Next it calls the BackupRead function to read the stream header. If the header contains the flag BACKUP_ALTERNATE_DATA then it points to a hidden stream file. In such a case it proceeds to reading the stream file name which is present after the stream header. After that it moves file pointer to next stream header through BackupSeek function. The same process is repeated until all streams present in the specified files are discovered. Also note that the same program can be used to detect streams within folder as well. This stream is created by Windows when user updates the summary information for the file. This is stream with zero size created by Windows when user updates the summary information for the file. This is another well known stream created by Internet Explorer for every downloaded file. It is basically text stream with size normally less than 50 bytes. This is a stream with zero size attached to the file 'Thumbs.db'. This is icon stream attached to the favorite links stored by Internet Explorer. This is stream of icon type belongs to Macintosh system. In addition to legitimate programs, it is also being used by malicious Rootkit programs such as Mailbot.AZ, Trojan.Win32.Agent.alt etc to hide their drivers. 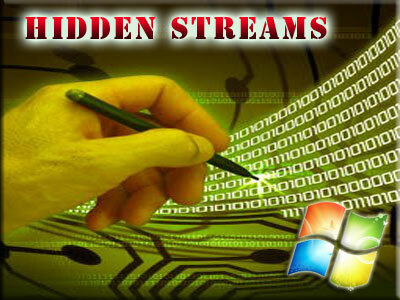 Due to nature of ADS, normal file browser tools cannot detect these hidden streams. We need special tools to discover and manipulate these streams. There are many ADS tools available, but most of them resort to only enumerating streams. Most of these are console based tools which are good for automation but not much useful for home users. 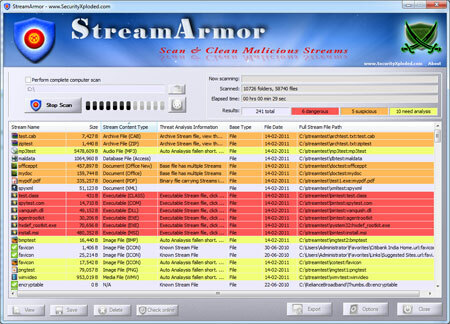 Here comes the new advanced tool, StreamArmor which can quickly scan for hidden alternate data streams as well as clean them completely from the system. It's advanced auto analysis coupled with online threat verification mechanism makes it the best tool available in the market for eradicating the evil streams. In short, ADS not only makes it easy for Rootkit programs to hide themseleves but also provides the covert launch pad to execute stealthily without making noise. Only sophisticated tools such as StreamArmor will greatly help in uncovering and destroying such hidden threats.